Washington Electric is here to help fix problems with your business and commercial power distribution. Problems with any part of your electrical system, it can have a huge and direct impact on you being able to run your business. Many business owners, in order to keep the business moving forward, will attempt to replace parts in the electrical system on their own. This can be extremely unsafe in certain circumstances. 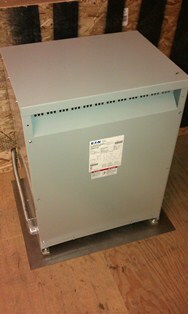 Call us today to have one of our qualified and licensed electricians repair and install new parts for your system. We here at Washington Electric want to make sure that you and your employees are kept safe and that your business can function normally. By having one of our electricians repair your system now, you can potentially avoid high repair costs and possibly lost business income. Making sure that your business's electrical system is reliable and effective is important. Another thing to remember is that when you are looking to upgrade your equipment, your electrical system may not be able to handle the load required by the new equipment. If your business is located in an older building, the electrical system may not be able to handle the amount of electricity needed to run a new air conditioner due to the older system and outdated code requirements. We do not want our business customers to be hit with a system failure when attempting to make upgrades. Please call us today to schedule a consultation to make sure that your electrical system is able to handle your upgrades. Installing upgrades should be done by a professional electrician that specializes in commercial projects. A commercial project is a large and intensive project that can be bigger in scale than even large residential projects. Regulations can be substantially different for commercial and residential projects. We can install simple upgrades for a small business storefront or a more substantial TI project. What matters to us here at Washington Electric is that you and your business are safe. Let our highly trained, qualified, and licensed electricians do the electrical work for you. 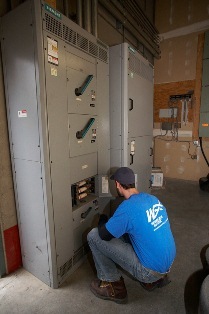 For a consultation about your upcoming upgrade or electrical project, call us today at Washington Electric.